The weather is absolutely insane here. It was only weeks ago that it was so hot it was hard to do anything strenuous, now its raining so hard areas are flooding, we lost power temporarily and I have to continually mop up our floors as the water seeps in under the windows! It’s the perfect day to read a book, watch a movie or bake cookies. 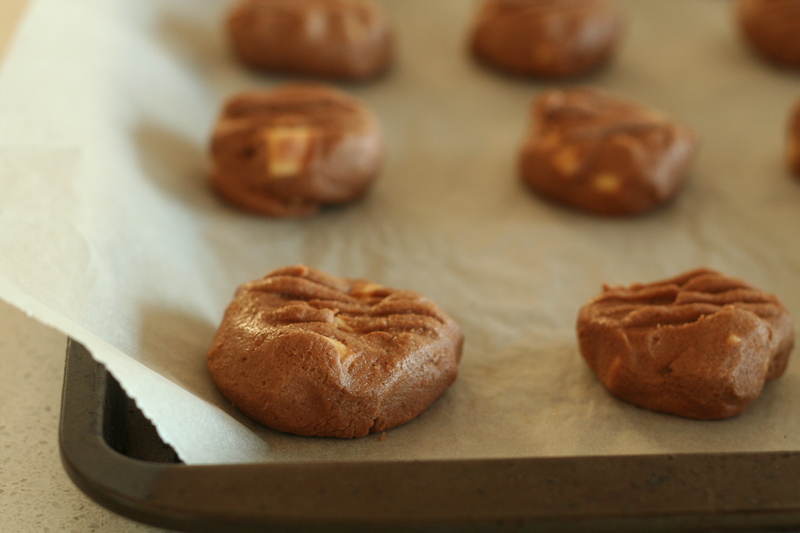 If you’re in need of some inspiration these cookies are a pretty good option. I started work last week after a thorough orientation meeting some of my super friendly and interesting colleagues. I knew that Monday morning would be highly stressful as I had no idea of how things worked or what the local protocols were (well, that and I feel like all the knowledge I once had has left my brain after a three month holiday! 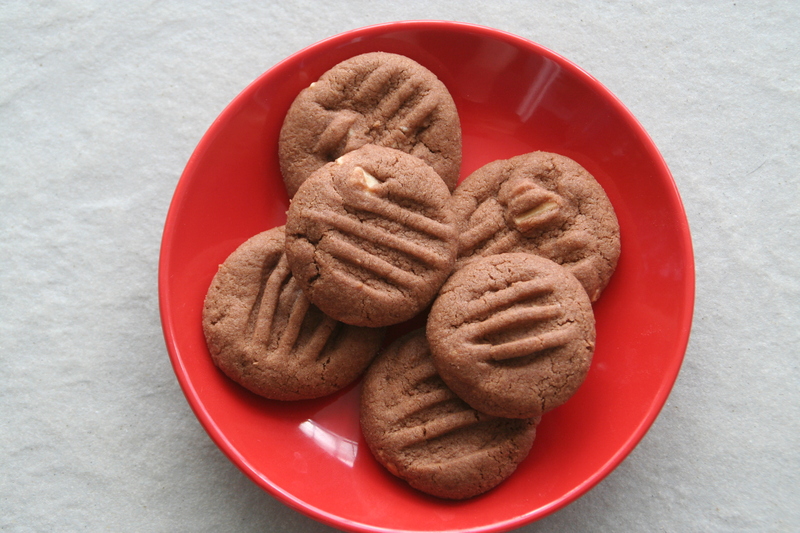 ), so I made these cookies as a comfort measure to eat when I was feeling overwhelmed. Turns out they work wonders. 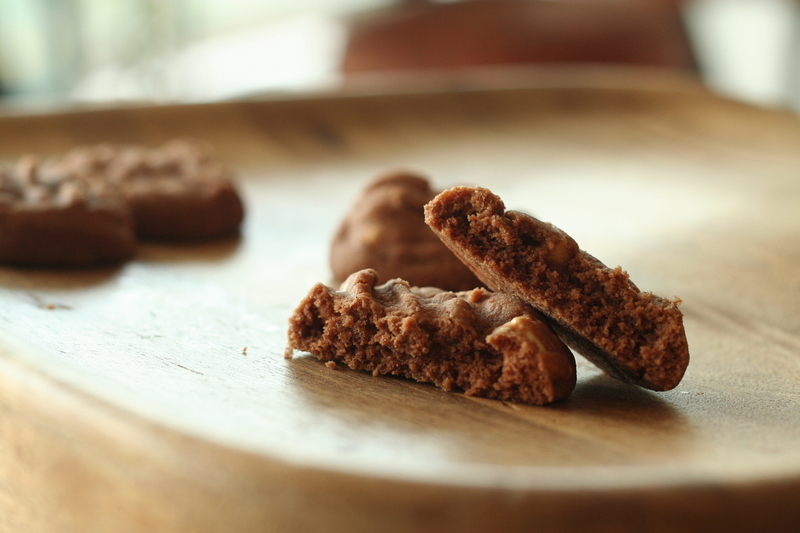 Crumbly and light, they literally melt in your mouth. Add in the chunks of white chocolate they’re a fantastic pick me up with a cup of tea and aren’t overwhelmingly sweet so it’s easy to eat a couple without even thinking about it (which may not be the best thing for the waistline!). Feel free to swap the white chocolate with dark or milk chocolate or even something crunchy like peanuts or smarties, personally though I think the white chocolate pairs really well with the cocoa in the cookies. Yes I do realize there is a lot of butter in this recipe but I’ve found that decreasing the amount stops the cookies from being as decadent and they don’t have the melting quality that makes them so endearing. Just do what I do and give them away before you eat them all. Preheat your oven to 160º and prepare baking trays. Sift together the cocoa, flour, baking powder and salt. In a separate bowl beat the butter until soft, then add the sugar and beat until pale and fully mixed (the longer you beat the light the cookies become – give it at least 2 minutes). Add the cocoa mixture and beat until combined into a soft dough. 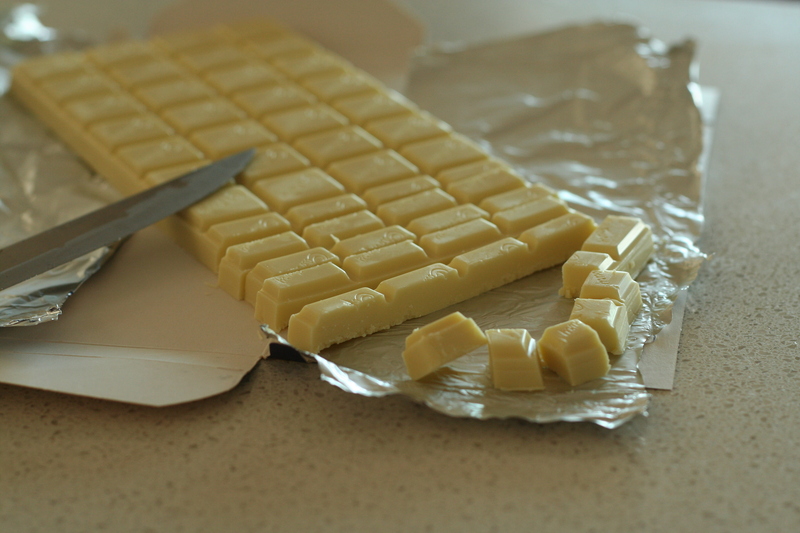 Add the white chocolate and stir through. 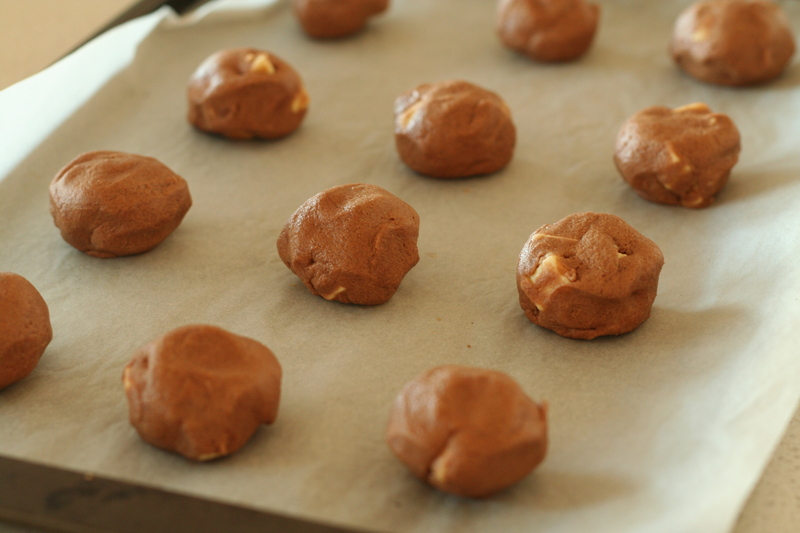 Take tablespoon sized amounts of dough and roll into balls. Place on the baking tray and flatten with a fork. Bake for 10-12 minutes or until firm on top. Allow to cool on the tray until they firm up then transfer to a wire rack to cool completely. 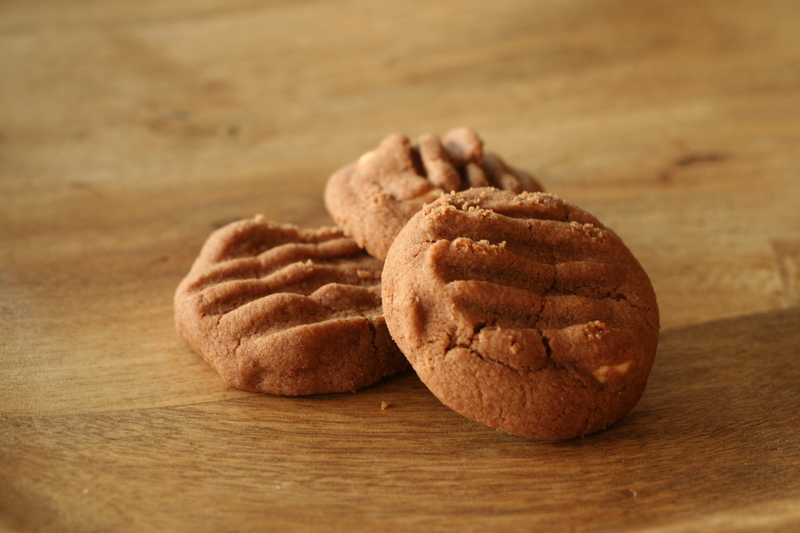 These look scrumptious…a nice change on a shortbread cookie! I have discovered (only within the last few years) how much I love shortbread cookies. Yay for a chocolate one! Eating cookies without even thinking is a regular problem of mine! These look delicious.